I’ve been sticking with healer Lifeline as my main in Apex Legends; I play support in most games that give me the option. I take my healer duties very seriously, rushing in to boost my squad’s HP and calling in supply drops whenever I can. In my mind, my responsibility as support also extends to taking my squadmates to Apex’s respawn beacons to bring them back into the game. This has led to some dramatic revival stories and helped me appreciate how the respawn system is more than just a way to keep playing. 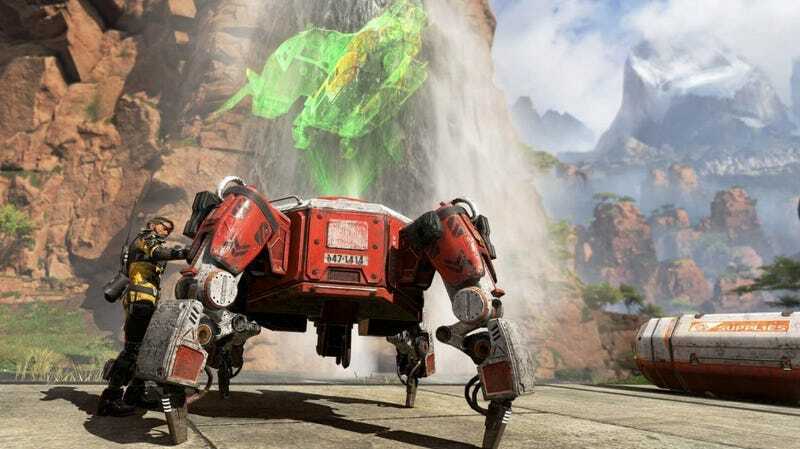 Once a teammate is downed in Apex Legends, you have 90 seconds to revive them. Even after the initial revive counter times out, you can grab their “banner” from their corpse and take it to a respawn beacon. This revives them in a dropship and lets them jump back into the game, though they lose all their gear. The respawn beacons are scattered at various points throughout the map, so getting to them and then waiting for a teammate to reappear can be time-consuming and risky. I’ve had some harrowing adventures getting to these beacons. Recently, I was playing with two friends and they both got downed in a narrow corridor early in the game. I kept our attackers at bay with grenades and gunfire long enough to scoop up both my friends’ banners. I then ran from the room where I was holed up, slid dramatically down some stairs, and ran around a corner and out of the building. There was a beacon nearby, but with the enemy team in hot pursuit, I chose another beacon further away. I raced toward it, sliding and leaping around enemy fire until I lost the squad and could revive my friends. We died not long after, but it still felt like a victorious comeback. In another match, I was playing with a friend and a random squadmate. Both of them were downed, but I managed to grab the stranger before his banner timed out. “I’m going to save you!” I shouted dramatically over voice chat. As I tried to make my way to a beacon, other squads kept popping out over ridges and taking shots at me. Instead of firing back, I changed course and kept running, sliding down hills and swerving through ditches. My straightforward route toward the beacon became more messy and roundabout with each new complication. “This is a marathon,” the stranger remarked over chat. He then told me no one had ever respawned him before, which only made me more determined to bring him back. After taking what felt like the longest possible route to a beacon, I respawned him and called in my supply drop so he could have some armor. We went on playing together until I was downed in another altercation. To my surprise, the teammate I had saved before came forward to grab my banner and respawn me, paying back my earlier efforts. We didn’t win the game, but our adventure took us from strangers to comrades in arms. My insistence on getting to beacons with my teammates’ banners has allowed me to create side stories in Apex Legends that run alongside the main narrative of loot-gathering and firefights. In other battle royales, like Fortnite, random squads usually leave me to die when I’m downed, and I just bounce into another match so I can keep playing. Apex’s beacons give everyone a reason to stick around, and they create an attachment to a team or match. Beacons give players a new way to work together and help the game feel fun and friendly. When I play a healer, reviving and respawning my teammates feels like the right thing to do. I even spent crafting metals to put my revives in the stats that show up before a match. I want the people to play with to know I’ll have their back, and it’s always exciting when they do the same.